ECUsim 2000 is a small, lightweight, benchtop simulator that can be used for testing and development of OBD devices and software. It supports all legislated OBD protocols, fixed and user adjustable parameter IDs (PIDs), diagnostic trouble codes (DTCs), freeze frames, and many other SAE J1979 services. The simulator can be purchased with any combination of “unlocked” OBD protocols, from as few as one to as many as five. The unit has five knobs assigned to common PIDs, a “fault event” button, and indicator lights for power, connection, and MIL (Malfunction Indicator Light). ECUsim 2000 features a USB connection which can be used to select the active protocol and monitor OBD traffic. 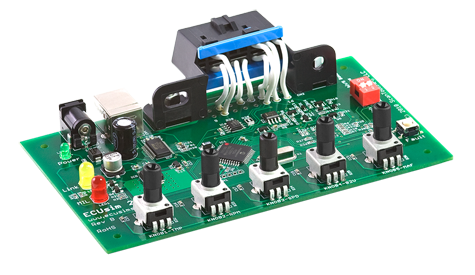 Supported SAE J1979 modes: 1, 2, 3, 4, 7, 9, and A. The ECUsim 2000 is offered in 3 firmware editions: Standard, Professional, and Ultimate. For more information about the features listed, please consult the ECUsim 2000 Programming Manual.